Birmingham - (14 February 2001) -- The big question in week three of XFL action is, Can Casey Weldon withstand the pounding much longer? Anyone who has watched the bolts is aware that starting Quarterback Casey Weldon is a one-man highlight reel for XFL smash mouth football. In fact for Weldon it has been smash Face, Smash ribs, Smash everything. Despite the beating Weldon has put up good numbers and led the Bolts to their first every victory on a bitterly cold frozen field that would make Bart Starr proud. In answer to these questions Dinardo only said that they were looking at several avenues to improve the blocking, The plays, the schemes, the personnel. Birmingham for the second week has been slow coming out of the gates. "We script our plays, We may have to look at how that is being done". Dinardo explained. When asked if he and the players had discussed the possibility of a championship Dinardo said they hadn't discussed that specifically. "We are concentrating on staying in playoff contention. That's all we're thinking about right now. Just stay in position to make the playoffs". "Anything can happen once you get there, a few players get healthy and a mediocre team can play much better. I don't see anything on this team that I don't think we can fix. New at Legion Field This Week!  The merchandiser who handled the season opener has been replaced and a new merchandiser will be set up three (3) hours before kickoff with increased presentation and locations. The fans have spoken and the Bolts are listening! Speaking on the upcoming game against Chicago Dinardo has major concerns about stopping Chicago's John Avery. "Our tackling needs to improve to contain a running back like Avery. You can be in position and still be grasping at air". After two weeks Dinardo spoke about what he is pleased and disappointed with. "I am pleased with the big plays from players like Casey and Stepfet. Practice last week was really good. I am disappointed with the consistency. The running game hasn't been as good as I would like. The tackling and punt protection have been a problem at times. On something like tackling you can't line up pro football players and have them beat on each other. You do that by picking up the tempo of practice. You have to get your body in front of the ball carrier. If you can do that in practice you can usually make the tackle in the game. The XFL continues to tweak the rules a bit. In week two each team was allowed to dress a player from the practice squad. This is due to the risk of injury in the opening scramble for the ball. A team can choose to use the practice squad player for the opening scramble or not but that activated player can only play in a game if someone either he or another player is injured in the opening scramble. Additional information was provided on how Injured Reserve works. Each team is allowed to pay only two players on IR. Birmingham is paying only one, former UAB receiver Kevin Drake. Other players have returned home, as they are not getting paid. The most interesting questions revolved around two goal line plays during the Birmingham/New York Game. Birmingham had a 4th and goal call, Dinardo and Casey spoke on the sideline about a sneak. As per XFL norm the cameras were prying into the conversation. As a fan watching on TV I was delighted. I assumed however that this conversation was not being broadcast on the big screen. According to local Birmingham media who were at the game they heard the call at the field level. This would of course mean that the Hitmen defense did as well. Weldon almost lost his head on that play when a Hitman linebacker shot the gap and hit him right in the chops. At another critical juncture the Hitman had short and goal near the Birmingham Goal. Quarterback Charles ("I can Take It") Puleri called time. He came to the sideline complaining to coach Rusty Tillman that "they can hear the play". Tillman just told him to run the play. I got the feeling that Dinardo was not as unaware as to these facts as he wanted us to believe. 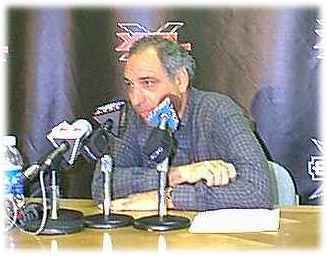 He said that the practice of "breaking signals" is old business in football and knowing the other guys play was not unique to the XFL. Asked if he would change the way he handled play calling he was evasive at best. One has to guess that this will be on his mind the next time Birmingham has a critical short yardage play. It also suggests the possibility of providing "misinformation" -- a popular government tactic. On the injury front several of you have emailed me about Tight End Ed Smith. Smith was a popular early pick on many fantasy league squads. A high ankle sprain just before the first game has sidelined him since. Dinardo said that it was a game time decision not to play Ed. "He just didn't feel strong enough to go". High ankle sprains can linger. I wouldn't expect him to have much playing time in the next two weeks. The weather this Sunday looks to be partly sunny and a little warmer than the last game at around 60 degrees. There will be numerous additional ticket booths around Legion Field in case another walk-up jailbreak occurs. You can bet the beer distributor won't run out of beer as they did in week one. Inside sources indicate that "A lot of money" was lost by under estimating the crowd for the first game. Hopefully Birmingham can step to the plate and put 30 thousand or more in the stands. A strong showing could help Birmingham stay above the league average of 33000 per game thus far.